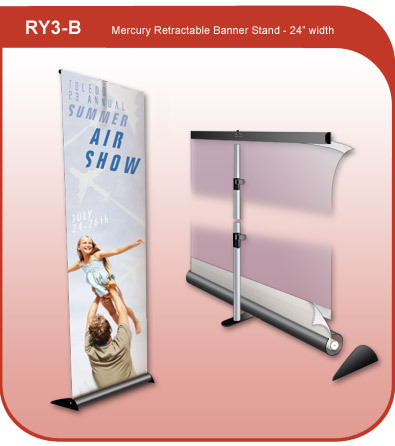 The Mercury Retractable Banner Stand is a versatile and lightweight 1 sided banner stand that can adjust from 36" to 96" in height. This 24" wide model works well with many substrates from vinyl, fabric, laminated film, and more up to 15 mil. in thickness. The model RY3-B is made of lightweight aluminum and can be set up and taken down quickly.